Over 1400 pages of novel notes were based on my relationship with Benito, a complex and highly spiritual Mexican immigrant who changed my life. Not only was it a love story, it was an experience that taught me about spirituality and deep connection with others. We shared the same nighttime dreams. I would think of him and he would call within minutes of my thought of him. As I began researching and writing the novel, I would read him excerpts from it and he would say "How did you know that? That is EXACTLY what happened!" Or he would tell me a story and I would reach over, pull out my novel notes and read it back to him almost verbatim. It was bizarre! It was amazing. It was about connection and the knowingness that comes naturally when you allow things to flow in your life. At the time the title for the book was Don Coyote and has since been renamed Trickster. So, back to Sedona. When I arrived at the private rental home, I was greeted by the owner Maria. She and I hit it off and we went for coffee at a local bakery before she left for LA where she was completing work on a screenplay. Over her coffee, she leaned towards me. "So, tell me what your book is about?" In a fragmented way, I told her it was about a Mexican guy and an American girl and that the backbone of the book was based on the life of the coyote who gets hunted, moves, adapts, survives and so on. Maria says to me "Watch out the back in the morning and every day you will see a lone coyote passing through the backyard." 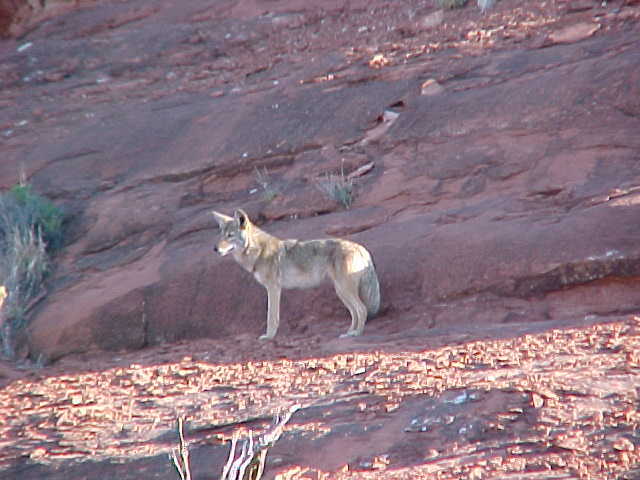 Here's a photo of the lone coyote taken from the rental house balcony the next day. Maria proceeded later on in our conversation to tell me about what it was like for her to buy her land in Sedona and to build her home. It was built high on the rocks and in order to access the main floor, you had to go up 16 steps to get into the house. She told me a story that when they were clearing the land, they found human remains. Now, in NY, finding human remains initiates a call to the police. In Arizona, bones, ruins, the ancient past of the area is uncovered on a fairly regular basis, so it was really no big deal that she found a femur and pelvic bones! I enquired "What do you DO with the bones when you find them?" She replied,"I set them aside and that night I went out, lit a candle, said a prayer and buried the bones at the edge of the property." Taking a mysterious breath and looking to the left and then the right, she said to me in a hushed tone, "You know, I believe that the coyote that passes through each morning is the spirit of the guy whose bones those were." Maria had no way of knowing that in my novel was a similar story. The Mexican guy's grandfather had traveled north to the US in search of work and had never returned. It turned out that grandfather's traveling companions had spotted a coyote at every twist and turn and they believed that the coyote was the spirit of the deceased grandfather who had been killed during a group border crossing. As I was looking at and half-heartedly pondering the land for sale from my car at the shoulder of the road, two coyotes slowly appeared at the front of my car -- one looked me directly in the eyes; the other one nervously followed him as he headed into the parcel that was for sale. I don't know if there was meaning in this (? reasons for all ?) but I was very oriented to the coyote at this point in my trip. Was it a sign? Was the coyote guiding me? The following week I was back in NY having lunch with my colleague, Mark. 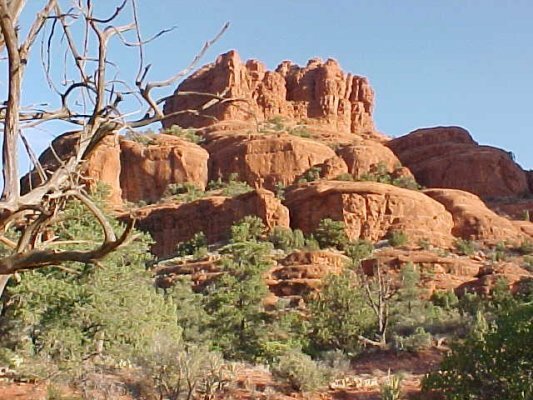 He asked me whether I had completed my novel during my time in Sedona. "Not yet," I replied, "but I've titled it Don Coyote." Mark then serenades the restaurant with "I am I Don Coyote the Man of Lamancha... Onward I go!" I made a face while I laughed at and with him. At the end of lunch we walked down the street and had gone our separate ways just as a woman was handing out flyers on the corner. I took a flyer to be polite and my jaw dropped as I glanced down at it. "Syracuse University Theater Productions presents: Man of LaMancha" and lo and behold, there was Don Quixote on his horse with Sancho Panza next to him. So next thing I know I'm surfing the internet looking for Sedona Real Estate -- I couldn't help it, Sedona seemed to take hold of me. One day I got an email from Gretchen at Sedona Realty (http://www.sedonarealty.com/) and the subject line read "Cute Little House." 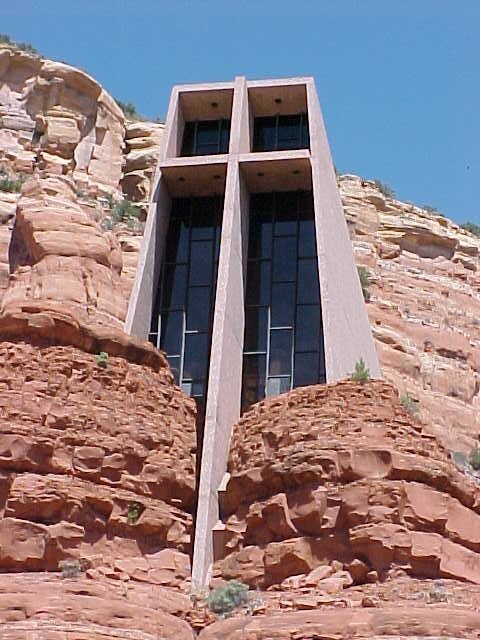 I opened it and it's showed a two bedroom, one bath (read between the lines - affordable) with huge panoramic views of Sedona. It was located on Tonto Rim Drive. 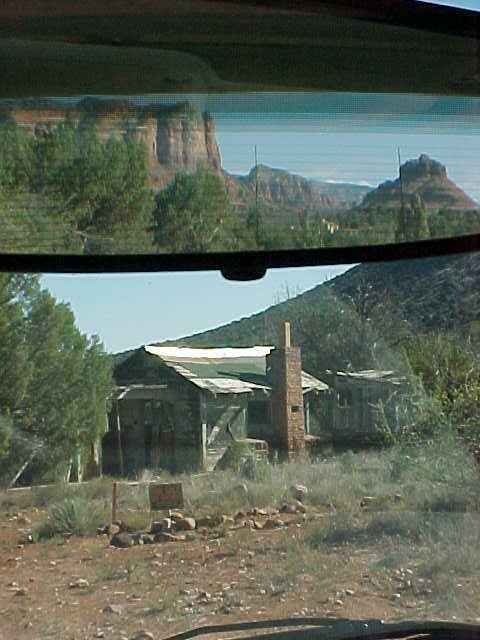 I viewed the 360 virtual tour and decided that when I go to Sedona in August (four months down the road) if it was still on the market I would go to see it. In the meantime (I have a tendency to enjoy researching details) I found out that the seller's name was Douglas Flackman, an oil artist. I had been told by Gretchen that the owner was relocating East to continue his work. 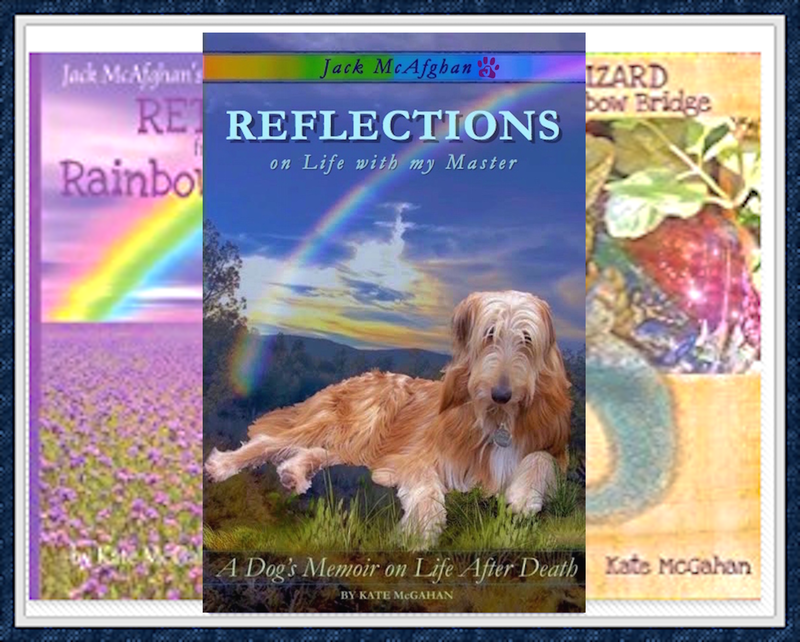 Since this feng shui consultant wanted to learn more about the energy of the "previous owner," I Googled "Douglas Flackman" and was taken to a webpage where I could view his beautiful work. Must be a good energy person to do this kind of work, I thought. In the meantime, I was preparing for my Master's program in Feng Shui and had to recruit client histories, hours and feedback for services I had provided. I was preparing a mailing and questionnaire for my previous clients. One day I realized I didn't have all of their addresses in my records. As I looked up my client "Kim Hennessey" in the phone book, I saw just above her name "Paula Hennerty." Paula was a nurse I worked closely with at Iroquois Nursing Home years before. I am not one to make a spontaneous call very often, but I made a call to Paula at that moment. We caught up on events from the past few years since we had seen each other--and when I told her of Sedona and Don Coyote and Don Quixote she replied "What are you DOING?! Don't wait! You HAVE to go out and see that house." I argued with her to an extent that I had too much to do, but then I looked in my calendar and surprise surprise, I had "SEDONA" written on the weekend of June 25. My mother and I had planned to visit Sedona and Mom had made other plans and had to cancel but I had never removed it from my day planner. So, June 25th I was on a plane to Sedona for the second time - for four precious days. 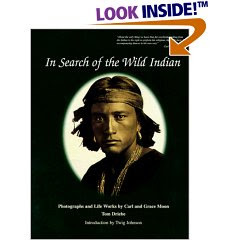 Oh, and in the MEANTIME, I had been corresponding with a guy in Pennsylvania who specialized in the archives and collections of Carl Moon, who photographed Native Americans in the early 1900's. Author Tom Driebe sent me a complimentary signed copy of a coffee table book he had written and two little used books that he thought might be of interest to me. One of those books addressed the "People of the Tonto Rim" --- Could this be the SAME Tonto Rim that housed Douglas Flackman's house for sale, located on East Tonto Rim? I took the book with me on the trip. 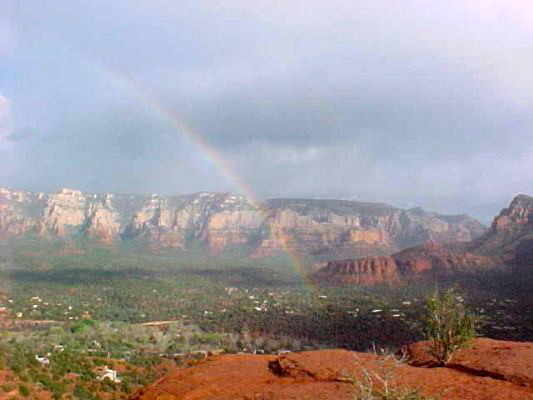 So, back in Sedona again, I find myself in pursuit of a place that I might call home. 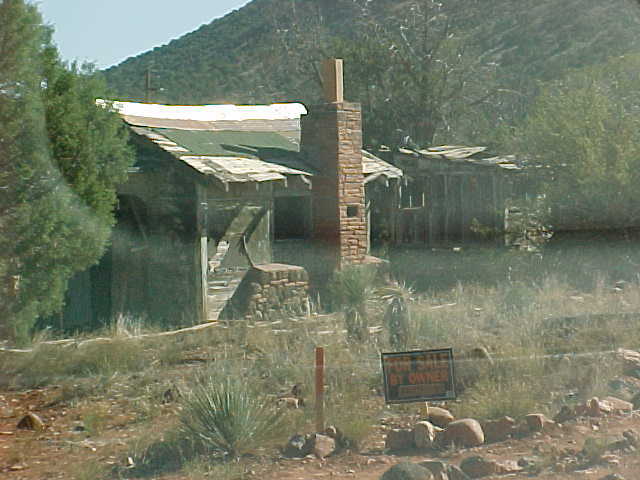 I went with Gretchen from Sedona Realty to go see the Flackman house. It was lovely enough but it just didn't feel like the house for me. It seemed like a bad joke! It called me here with its beautiful views and the moment I walked through the door I knew it wasn't the house for me. This would not do. What the heck am I doing here in Sedona anyway?! Am I crazy? I spent the weekend driving all around, getting a "feel" for neighborhoods and spaces. Not far from the Flackman house was a huge green area. I remembered when I had left town the last time that I had glanced over at this particular landscape and said to myself "Hmm. I wonder what that is over there?" I assumed it was National Forest land or something. Little did I know it was an introductory glimpse of my future. The acre+ lots had been divided and were For Sale By Owner. I decided to explore. It was not long before I was writing my family and friends at home that I could not even afford a chicken coop in Sedona. One acre with a crumbling coop was priced at nearly $100K. The price of my whole house in NY. The journey was leading me to realize that Sedona was out of my league. But how do you put a price on the view from the coop? Rear View Front View from the Coop! It was all too soon time to leave Sedona, but not without many photos of this parcel. The last photo I took was from across a nearby field. I went to take a long shot and I had to stop and look twice. 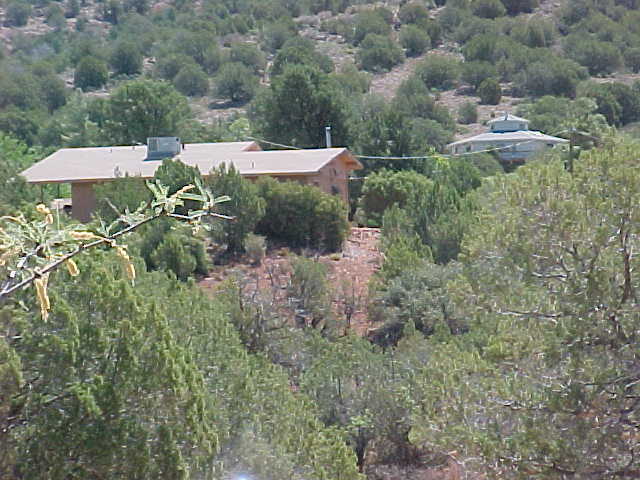 There, peeking out above the trees at the top of the property, was the "Don Quixote" house in clear view. Just after I put in the offer in on the land, I took a drive uptown to get a smoothie at the local coffee shop. I sat in the shop and looked around me at the people who were milling around. It was a shock to realize I had just put an offer in on a piece of land in a community that had so many people who seemed so unlike me. They seemed kind of like misplaced new age hippies. Oh my God. What on earth was I DOING? Had I made a mistake? My goodness, I had nothing in common with the people in this town! I came from a very traditional town. As I was pondering this, my heart fluttering, they called my number to give me the smoothie and I quickly left the place. I then drove down the street to a New Age shop and went in to buy a couple of souvenirs. When I approached the counter there was a lady in a long flowing mumu with long hair and big-lensed glasses. She was a bit strange-looking to me, as most of them were, but she looked at me with warmth and kindness and in a gravely voice said, "Did you find everything you were looking for?" I replied, "Yes and more. I'd better just move here so I can stop buying souvenirs!" She looked me straight in the eye and it was like the moment was frozen in time when she said to me, "You are being CALLED HERE, you know. You are MEANT to BE here. Do you KNOW that?" I said "I guess so," and I paid for my stuff, thanked her and left the store. I returned to New York and proceeded to go home to get my house there ready to sell. After all, I had to sell the it to buy the land, so things were now set in motion. I was assuming my offer would be accepted. Hmmm was Don Quixote was leading me after all!? Three days later my offer was accepted. I put my entire retirement account in escrow (and sent it off with a SMILE!???) -- agreeing to lose most of it if I didn't come up with the remainder by the October 1st closing date. 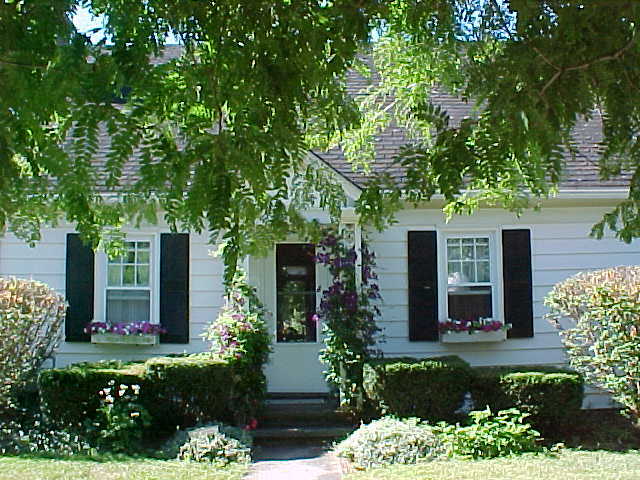 I put my beloved NY house on the market a week or so later. AND ALL THINGS, WHATSOEVER YE SHALL ASK IN PRAYER, BELIEVING, YE SHALL RECEIVE.... Ask, and it shall be given you; seek, and ye shall find; knock, and it shall be opened unto you... For every one that asketh receiveth; and he that seeketh findeth; and to him that knocketh it shall be opened. ...Therefore I say unto you, What things so ever ye desire, when ye pray, believe that ye receive them, and ye shall have them. Mom and I went for a happy hour margarita at The Wild Toucan Restaurant and then we proceeded to visit my property. At approximately 7:15 pm, she and I were on the Southeast ("Wealth") corner of the property planting a special silver dollar that she had given me on this trip -- along with a copy of the prayer from the Book of Mark. A few hours later a call came in from my realtor in NY. Apparently at 10:15 PM (with a three hour time difference between NY and AZ, it was at EXACTLY the very moment we were planting the prayer) the paperwork was signed for a full purchase offer on my house in NY. And that was weird too! The buyer had come into NY from California for the weekend for a reunion. She and her husband took a trip down Memory Lane and drove by her Grandma's house and found that it was For Sale. She went up to the front door, looked in the window, called over to her husband, "Honey! I have to have this house" and he says "OK." They went to the reunion dinner, met with the realtor later, signing the paperwork late in the evening and were on a plane back to California the next morning. The house had come full circle and ended up back in it's own family. ...And after following the signs and messengers, I, too, have ended up where I need to be.